The lithium-ion battery is the most expensive component of the Nissan Leaf, pictured. TOKYO (Bloomberg) -- Nissan Motor Co., which will start selling its Leaf electric car this year, aims to cut the cost of the vehicle's lithium-ion battery pack to less than $370 per kilowatt-hour to make a profit from the model. The target compares with the Japanese government's industrywide estimate of about 150,000 yen ($1,600) per kilowatt-hour, said Masahiko Otsuka, president of Automotive Energy Supply Corp., a joint venture between Nissan, NEC Corp. and NEC Tokin Corp. that is making the battery for Nissan. “Our target is a lot tougher” than $370, Otsuka said in an interview at AESC's headquarters in Zama City, west of Tokyo. The cost depends on factors including the scale of production as well as resale value for recycling, he said, declining to give a time frame for the target. The lithium-ion battery, which stores 24 kilowatt-hours of energy, is the most expensive component of the Leaf, which will sell for $32,780 in the U.S. and 3.76 million yen in Japan before government incentives for consumers. Nissan, which doesn't sell a mass-market gasoline-electric hybrid car, is introducing the Leaf in response to government emissions rules and potentially higher oil prices. Nissan's battery currently costs about 1.05 million yen, or $472 per kilowatt-hour, according to Takeshi Miyao, an analyst in Tokyo at auto consulting company Carnorama. Other components cost about 1.4 million yen, and labor and other indirect costs must be contained to 35 percent of the sticker price to secure a profit, he said. The Japanese carmaker is spending more than 500 billion yen developing electric cars to compete with Toyota Motor Corp.'s Prius and Honda Motor Co.'s Insight hybrids. Nissan plans to spend 430 billion yen in total research and development this fiscal year ending in March. Selling the battery to other customers will also cut costs by increasing production volume. Potential buyers outside the auto industry, including defense contractors, have approached Nissan and AESC, Otsuka said. 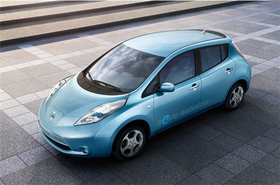 Nissan's CEO Carlos Ghosn said earlier this week he aims to have capacity to build 500,000 electric cars a year by 2012. He estimates demand will reach 10 percent of the global car market by 2020. Nissan and its biggest shareholder Renault SA plan to build electric cars at plants in the U.K., Japan, France, Portugal and Tennessee.